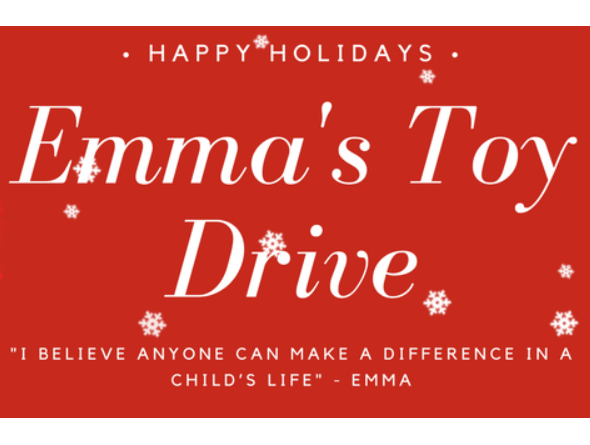 Guelph Nissan | Blog | Emma’s Toy Drive in it’s 16th year! Emma’s Toy Drive in it’s 16th year! We are excited to announce, we have partnered with Emma’s Toy Drive again this year as a drop off location for toy donations! Emma’s Toy Drive is a local Guelph-Ontario based Christmas charity. They collect toys and gifts annually to give to the Women In Crisis Shelters of Guelph-Wellington County. This years focus is on Teenagers. We are looking for donations of Gift Cards for movie theaters; restaurants; shoppers drug mart; sports gear; make-up; hygiene products; scarfs; gloves; craft kits; socks; pj’s; or both products! Emma’s Toy Drive started over 16 years ago when Emma was 8 years old. After reading a sad book, it made her realize not all children get gifts on Christmas. This was shocking to her as an 8 year old and so she took action. It started small, she began caroling around her neighborhood and collecting donations. She was able to buy three toys and donated them to the toy drive at Guelph’s Stone Road Mall. The next year, she wanted to go bigger so she stated her own toy drive. Over the years, Emma has collected over 22,000 new toys/gifts to the women in crisis shelters of Guelph and Wellington County.